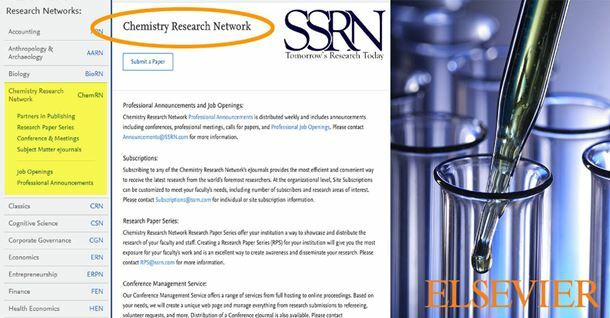 Elsevier has announced that SSRN, the world leading working paper repository and preprint server, has launched the Chemistry Research Network – ChemRN. The launch of ChemRN follows hot on the heels of the BioRN launch in June 2017, SSRN’s new network dedicated to biology and its first outside the social sciences. BioRN already has nearly 5,000 papers live from approximately 6,500 authors. Researchers can share ideas and other early stage research, including posting preprints and working papers on ChemRN. Users can quickly upload and read papers for free, across Chemistry, including the fields of Energy, Environmental and Materials Sciences. Join Gregg’s live webcast on August 17. Researchers can post preprints and working papers on ChemRN, share ideas and other early stage research, and collaborate. It allows users to quickly upload and read abstracts and full text papers, free of charge. SSRN has been serving the research community since 1994 and was acquired by Elsevier in May 2016. Since joining Elsevier, SSRN has completely redesigned its website making it cleaner and easier to use. It has also launched full-text search. SSRN is now working towards deeper integration with Elsevier’s other research products, particularly Mendeley’s reference management software and Pure’s research management system. Granta Design has reportedly made two important improvements in its materials support software.